I’ve always wondered wether or not Brook would release a CNC machine. I got the answer to that question when he released info on a CNC machine plan to be released late fall. 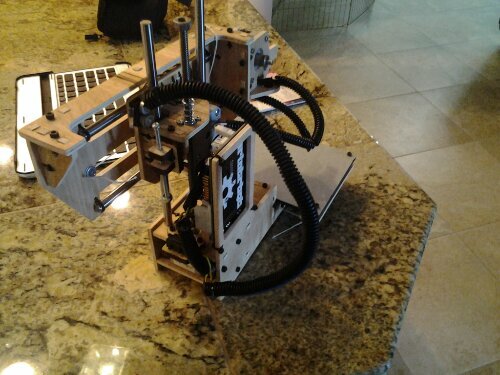 Brooks goal was to make a beginner CNC machine that was both easy to use and affordable to the beginning user. CNC machines are what we call subtractive manufacturing while 3-D printers are considered additive Manufacturing. Having both would definitely cover the majority of needs for a small to medium sized shop. A good portion of us advanced users started off with multi-axis CNC machines. I was lucky enough to have CNC experience passed down to me through friends and family. 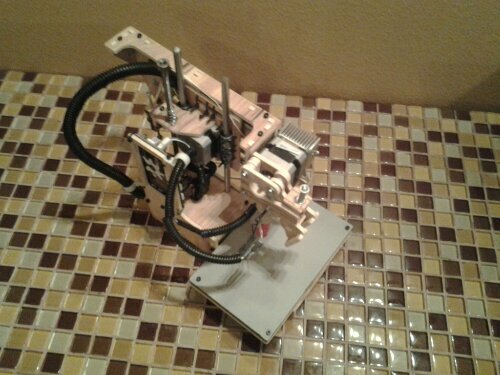 The first 3 axis machine I had ever built was a desktop sized CNC machine. The nice part about desktop sized CNCs is that they are typically large enough for most projects but, still small enough to fit in most spaces. 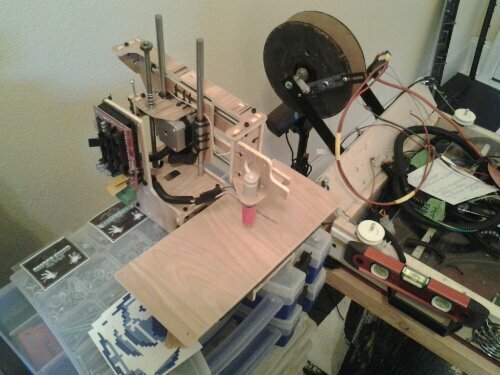 Printrbot’s CNC looks to fall in line with these types of setups. 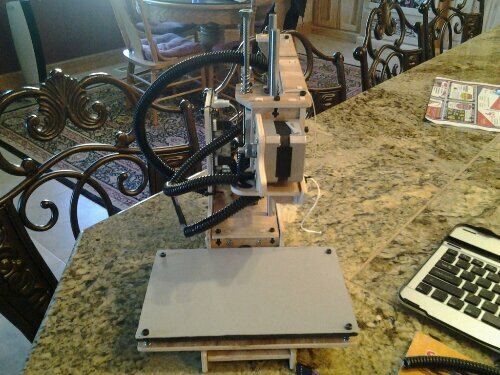 Printrbot’s CNC shows lots of promise with a wireless setup that will allow you to operate the CNC from your iPad. From what we’ve heard, the build is open source with the control setup being excluded. The reason behind the closed source control software is due to it being built outside Printrbot’s shop. Early pictures show that it comes with a nice controller case with a large emergency stop button that is a must when owning a CNC. Having completely enclosed electronics is also important due to all the dust that builds up during operations. No word yet on if Printrbot will offer a dust suction system which would help to keep the particles to a minimum. Nema 23 motors are used on this platform which are quite a bit larger than what were used to. I can imagine that Printrbot will continue to let their CNC platform evolve after it’s release in the late fall/winter timeline. I do know that Brook has a lot of passion when it comes to both CNC and 3-D printer design. This passion translates into a great product at an affordable price. 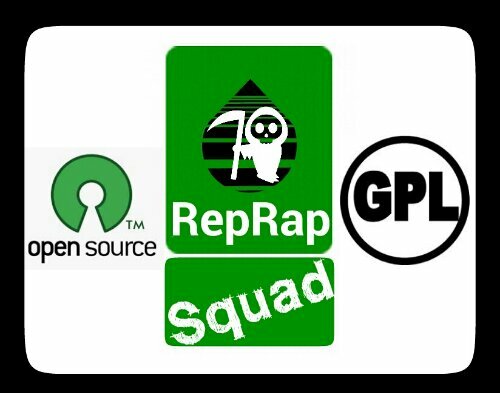 RepRap Squad will defiantly be following the progress on Printrbot’s CNC and updates will be posted here. 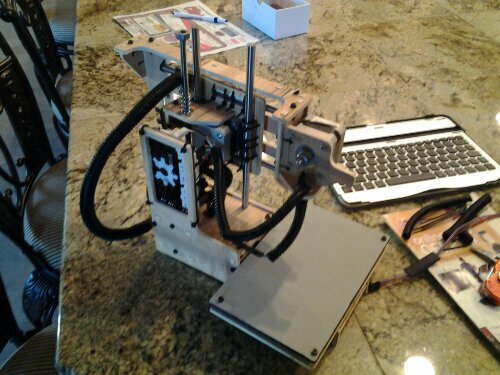 I decided to not only CNC out a Printrbot Simple for a contest that Brook decided to put on. 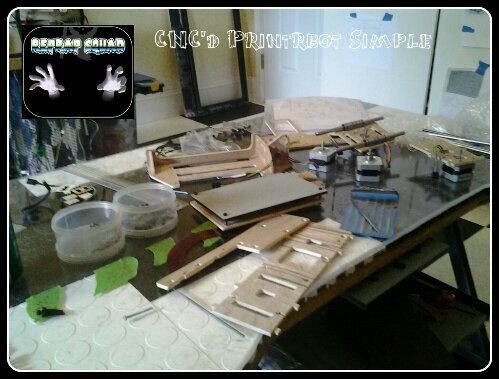 He said for the 1st 5 printed as well as the first 5 CNC cut simples he would give away a simple builders kit. This challenge got me to work on my CNC that has gone by the way side since I’ve dedicated so much time to the 3D printing industry. I needed to replace the axis couplers and do a little maintenance. Getting a Simple builders kit will go a long way as it will be used as a teaching tool to show the wide variety of printers. It also works great because it is well, simple. It is a lot easier to teach about 3d printing with a bare bones setup. I also decided to make a few small changes to the design as I have heard from current owners that there are a few small issues with the design files. None of these issues are hard to fix. Just a little extra cut off here and there which I will get into later on. I’ve started cutting out the main or larger pieces of the Simple which will allow me to do any calibration that may be needed. I think its really cool that Brook @ Printrbot does little contests like this, it gives people like us the ability to challenge ourselves and be able to get access to parts we couldn’t usually afford. Brook understands that the maker/hackerspace is important to them as a company. Joining the communities and giving them more focused concepts to ponder is a great way to give back as well get help with Printrbot’s designs. 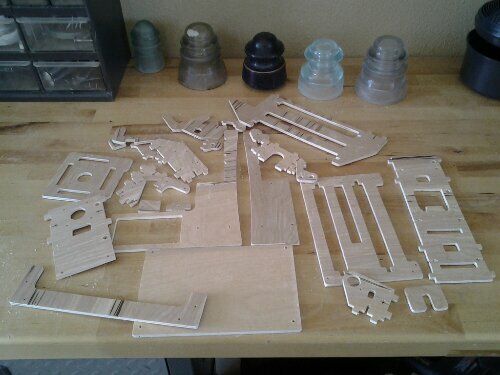 We cut out all the Printrbot pieces needed to make the simple. We had to use an offset and play around with the design as these files were originally ment for a laser cutter. 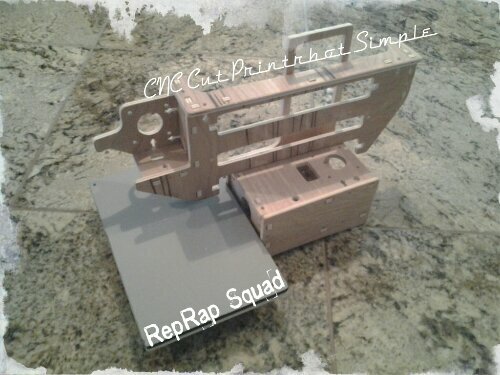 We posted the pics on Twitter this morning which should make us the 5th out of 5 CNC’d Printrbot Simples to be done. This is exciting news for us because we work on donations and dont havd a lot of money for tools to teach such as the wonderfully designed Simple. 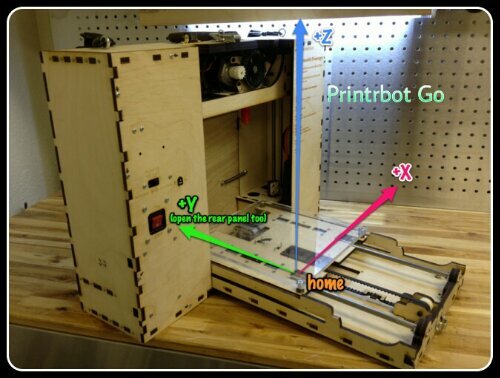 “Printing A Future Foundation, ” is kept alive with the help of makers everywhere and companies like Printrbot. We have had lots a donations lately and we are trying to enter every contest we can in order to build more kits, get more teaching aids, and build more 3D printers for donations all over the U.S. The printrbot simple is perfect to teach kids how 3d printers work. It also shows the different methods of transferring linear motion. 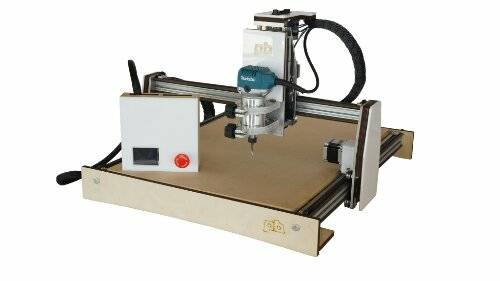 I’m excited to start building and would love to be the first to build a functional CNC’d printrbot. We will hopefully find out soon but telling from the Twitter feed we should be the 5th out of 5 winners. We are currently waiting on a custom end mill that is being made to cut out the receivers for the tabs but this is a very small part of the process. We also had to change some of the files to work on a CNC machine. This made things tricky. We have been working non stop since Brook drumm announced the contest and released the simples files. We decided to use quarter inch burch wood with a beautiful grain pattern. 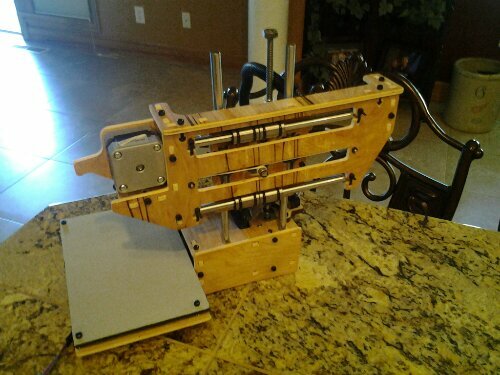 Update: We just recieved the word officially from Printrbot that we are the 5th and final winner of the contest. So as soon as we get our builders kit you will be seeing a functional Printrbot Simple that has been made from CNC cut wood. In birch too. The birch was a little expensive but the super cool grain patterns were well worth it. Update: July As per a challenge from Brook to see if we could alter laser cut Simple plans to cut them out on our CNC machine. We did it, now we are on to pre-fitting all the structural parts with no bad surprises. The only parts we haven’t test fitted is the direct drive extruder due to a couple of pieces not being in the original file. We now have those pieces cut and we will be test fitting those soon. Next we will be stripping everything back down again to finish sanding and prepping for paint. So far our plans for the color scheme will be black & grey. More of a greyish whitewash look. After everything is prepped we will start putting together all the hardware that came in our builder kit. 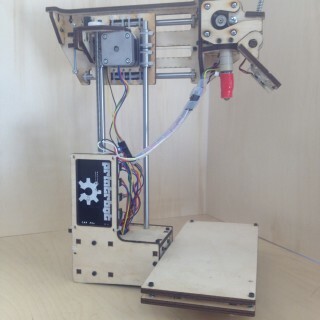 The builders kit is a great deal and is highly recommended by RepRap Squad. I will update as the CNC Simple build comes along. We are now to the test fit stage for hardware. 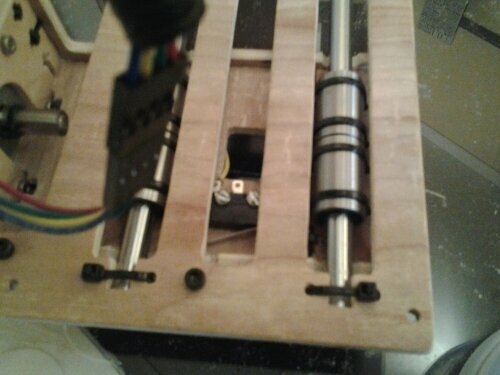 All the motors fit snugly in their spots as well as all 12 of the 8mm lm8uu linear bearings. It also looks like all the bolt and nut traps fit together well. All of our pieces fit together so tight that we had to do very minor sanding. We could of left it the way it was but we wanted to be able to take it apart and put it back together with ease. Today we will finish up any sanding needed and start putting together the hardware. Everything but the bed (which is already painted) will get painted later on after we get everything how we want it. 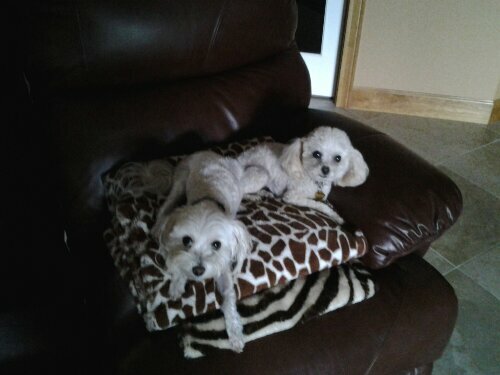 I’ve added these updated pics. You can see that we are getting close to being finished with the hardware. 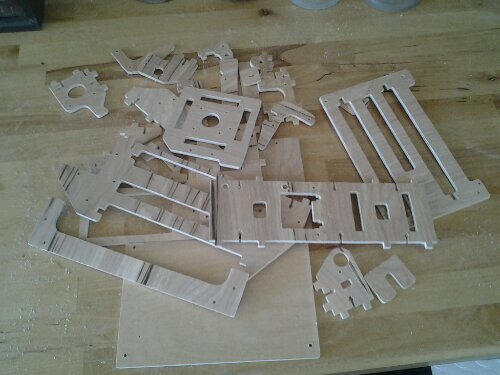 We still need to CNC cut out two pieces for the extruder that wasn’t in the early files we recieved. We should be up and running in the next few days as we are taking our time with this build. Today we I worked on running wiring and finishing up the hardware. We also worked on installing the and stops. This was a little tricky for us to figure out at first given the little amount of documentation found online. So we took some pictures to show you where the end stops go for the simple. Below you can see the X, Y & Z axis endstop locations. 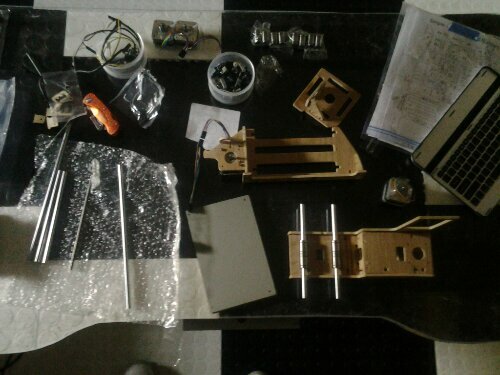 We started running all the wiring and getting all the parts together for the extruder. 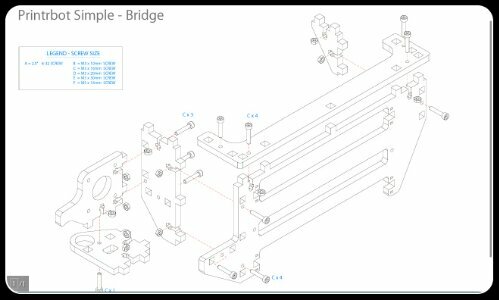 We also started assembling what we could of the extruder but there were a few designs missing from the released files we hope to get these soon so we can finish the extruder assembly. I have contacted Brook to see if these files have been updated. 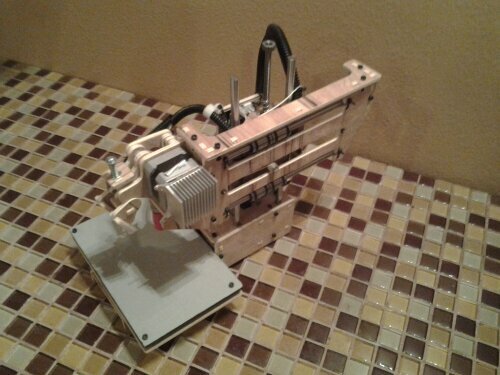 We also plan on getting the added fan for the Simple that is sold on Printrbot’s web store for $10. I finally finished mounting sll the endstops and running all the wiring. 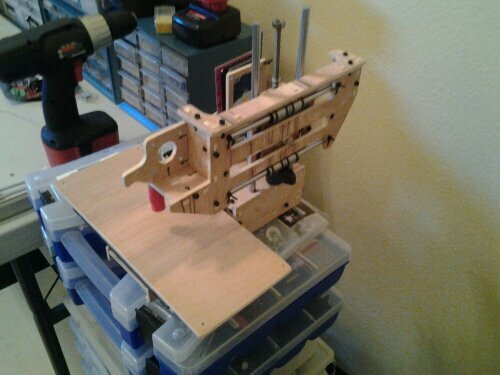 I also finished putting on the spectra line on the X and Y axis. I spent some time with cable management as I wanted everything to be mounted cleanly as well as to be accessible for any future modifications or troubleshooting. This should save me a lot of hassle later on. Everything is labeled clearly on the printrboard, which makes installation fun. The Y axis endstop required me to use somd washers as I didnt have the correct bolts. This was caused by our miscalculations when CNC cutting the endstop mounts. It was an easy fix and I will buy the correct size bolts as soon as I can look through our enormous mostly unorganized stock. 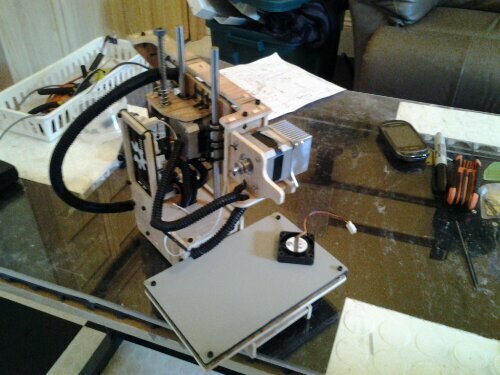 Tomorrow I hope to get the last few pieces done for the extruder and then we will be printing and calibrating. 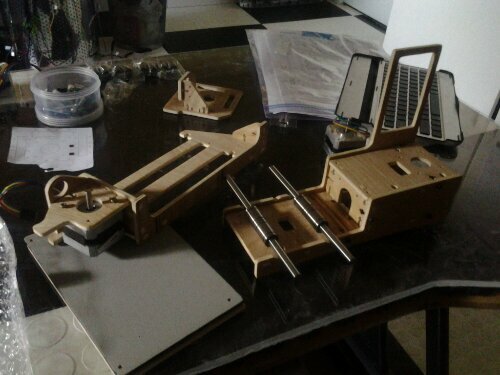 As you can see in the above picture we have already started some mods on the Printrbot Simple. 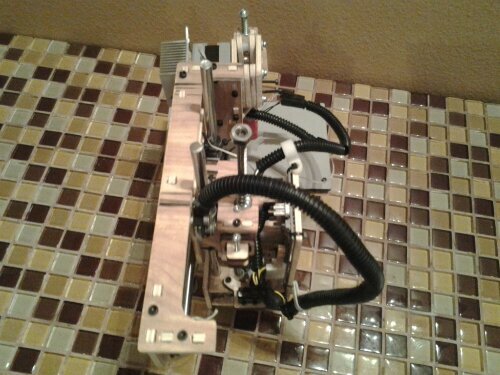 We’ve added a heatsink to keep the extruder motor happy and cool. We are also adding the fan that you see on the print bed to the front of the extruder to keep everything cool as it goes through the direct drive system. We will also be adding a small piece of bowden PTFE tubing in between the filiment guide and the hobbed gear. 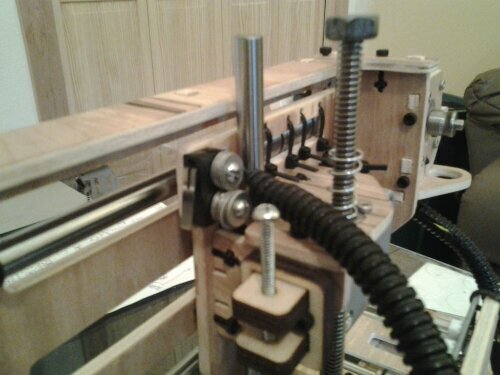 This will keep the filiment from bending or binding in the extruder. It’s a cheep little trick that is used on a lot of direct drive extruders, especially when using 1.75mm filiment. Tomorrow I will have some stuff awaiting me at the USPS office. My filiment samples sent to me by maker geeks should be arriving. This will be perfect timing as I will be able to test them through my newly built CNC cut Simple. 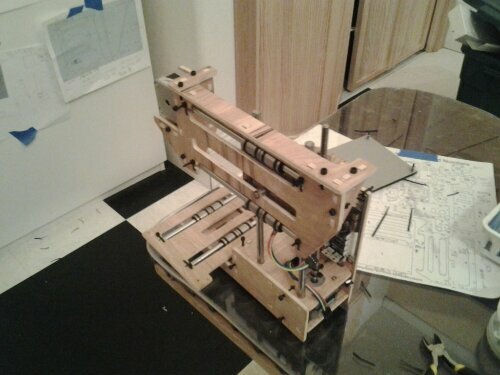 I have a lot of plans in store for this beautiful one of a kind Printrbot Simple and I cant wait to start modding. 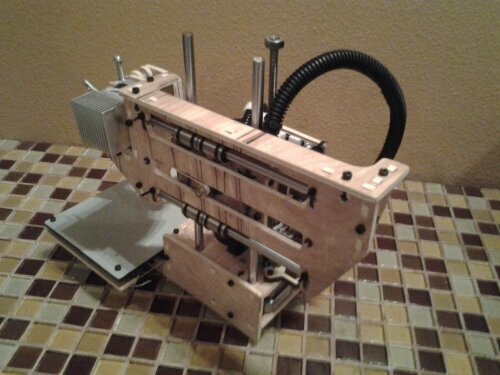 Here’s the final finished and calibrated CNC cut Printrbot Simple. I was lucky enouph to have a buddy with a printrboard that was already setup for the simple, so we used his. Plus i didnt want to use my new one because im going to use it for my printrbot plus. 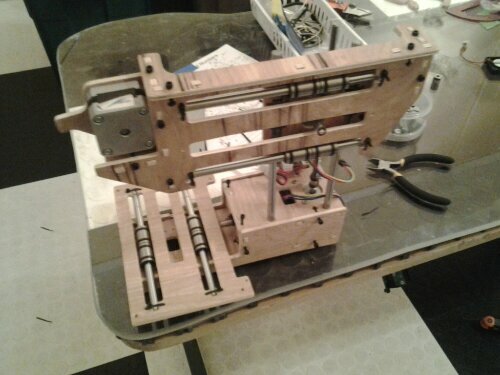 Soon after all that work I had to take her apart to use for my Printrbot plus v2 dual extruder beta build. 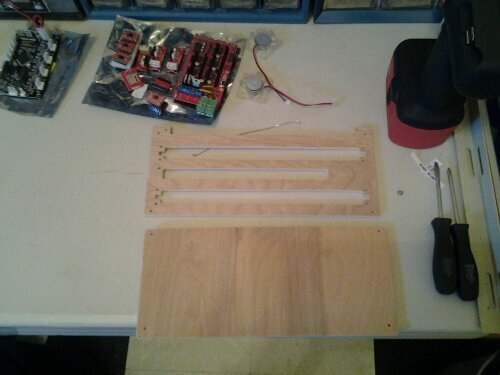 Eventually I will be putting back together using a spare RAMPS 1.4 board that I have along with 2 different steppers. Here’s the final build pics, I will post more when I hage time to change it over to RAMPS 1.4 setup. I wouldn’t be me if I didn’t do any modifications. I love pushing the envelope to see what is possible with these machines. 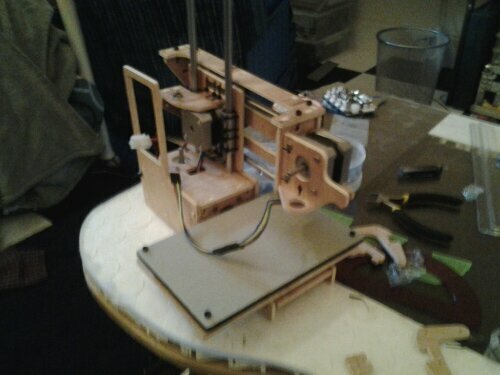 One of my first modifications will be to extend the print bed as well as the sub mount. Im debating at this time to switch the bed over to a belt. 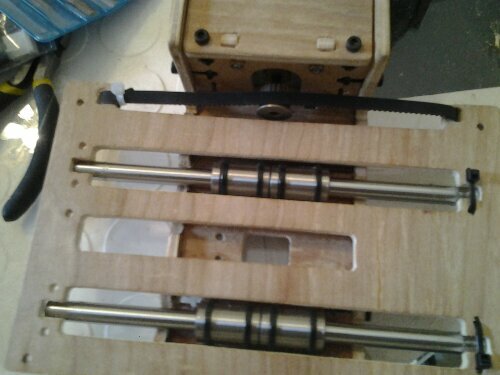 The spectra line works well and is a good way of creating linear motion but, I have some spare belts and matching gears. Since I’ve already taken two motors off of the simple it only seemed fitting to put two more back on. I will also be switching controllers from the stock printrboard to a new RAMPS 1.4 setup. I also have 3 makerbot endstops that I might use if there is space to mount them. Makerbot endstops are larger than the Simples add on ones because they have LEDs and quick connect plugs. The LEDs on the endstops let you know that they are active as well as if they are tripped. This makes troubleshooting endstop issues a breeze. 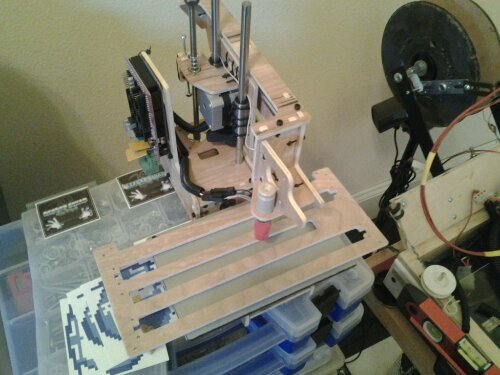 So as a quick recap of the modifications I will start out with are as follows: Change out 2 motors, RAMPS 1.4 controller, Makerbot endstops, bed+submount extensions and change the bed from spectra line to belts. I will update with build info as well as pictures as I go along. I finished cutting out the bed extension and sub mount. I ended up extending the bed about 3.5″ longer. This comes close to doubling the print size and will allow me to print a wide range of items. More then likely due to the length of the bed I will add 2 more spring leveler mounts to the middle. This will allow for better accuracy and a bed that is consistently level. If it wasn’t so skinny this probably wouldn’t be an issue. I plan on adding glass later which will help as well. 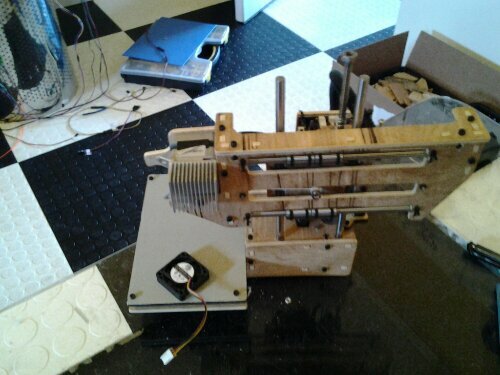 I started to disassemble my Printrbot simple so that I could put on the new motor with an aluminum pully. 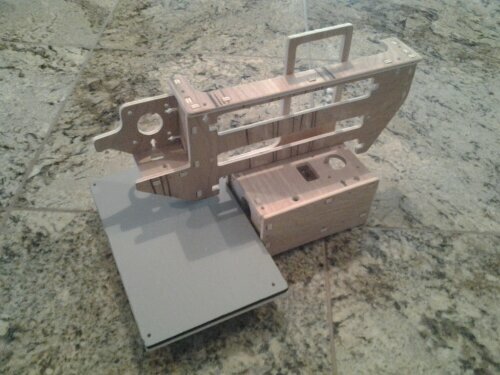 This will transfer into linear motion through the belt I will be adapting for the movement of the bed. I’m still debating wether or not to replace the other spectra contrlled axis with a belt. 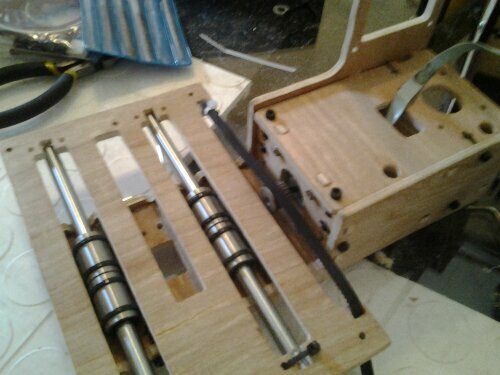 This axis will be a lot harder to use a belt on due to the position of the motor and the mounts. So far the motor went in perfectly as it is about the same size as the stock kysan motor I removed. 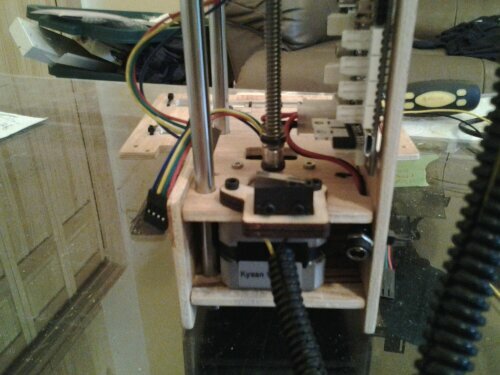 Printrbot has recently released a extension for the Printrbot Simple. Longer z axis as well as a longer bed. It looks like our cnc simple is going to need some new mods. Currently we are working hard on project “XL” but, once we are finished we more then , likely will have to test out some new mods. 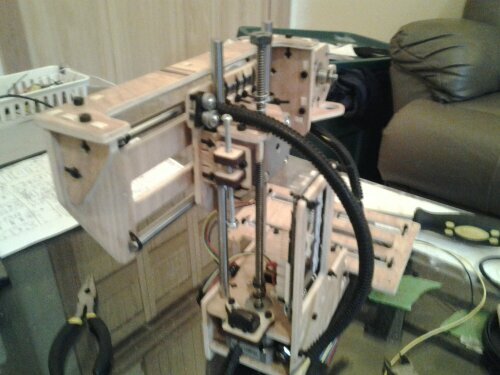 Here’s a picture of a Printrbot Simple with the new extended print space. This is a custom built power supply. 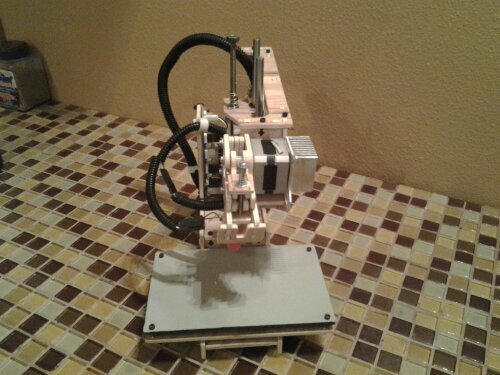 The transformer that I put in my CnC. It offers 24 v and 12 v @ 31 amps on the 2ndary. It’s a custom built transformer that was originally used for high end stage intelligent lighting. On the primary side it offers U.S. and foreign input voltage. It offers, input and output fuse protection for both lines. It also has a mini fused power strip for a USB power splitter as well as any other wall plugable power needed . It has an internal fan and dual exhaust fans. In the front it has XLR inputs for mechanical end stop switches. 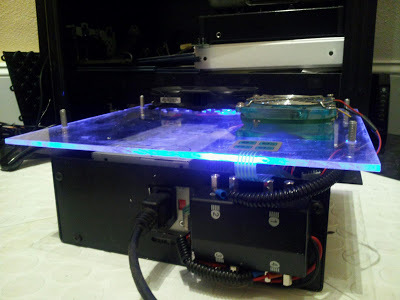 Of course it also offers led’s as well as a spring loaded acrylic top that has solenoids to raise and lower the top. These are used for cooling. 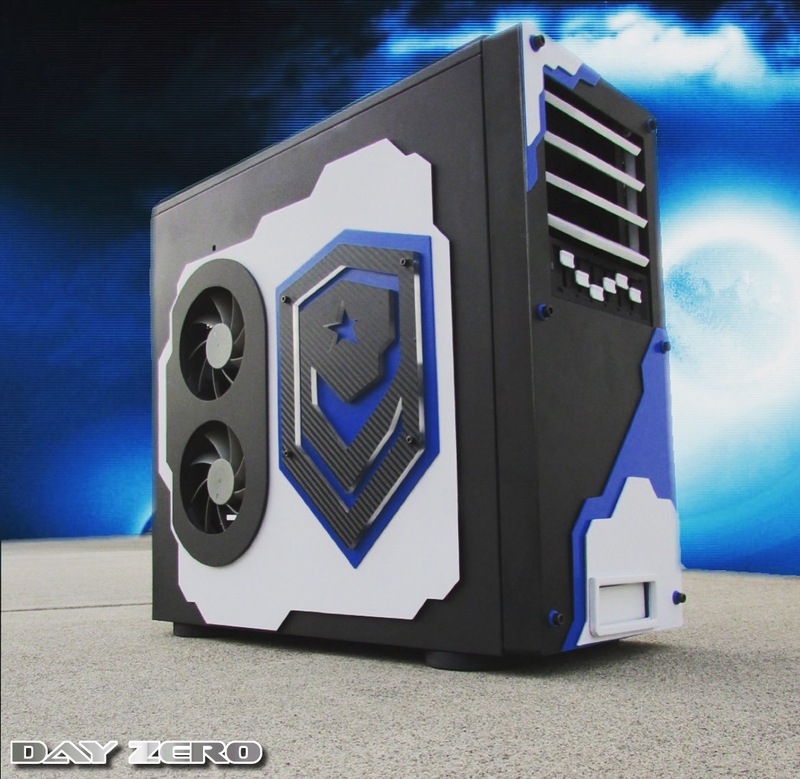 The fans also adjust speed and rotation direction according to cooling needs. The solenoids and fans are ran through an Arduino sketch that I wrote. All in all It’s a great power supply for cnc but it might be too bulky for RepRap usages. 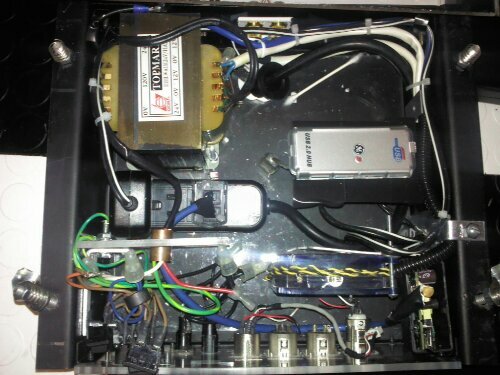 The inside of the heavy duty power supply.